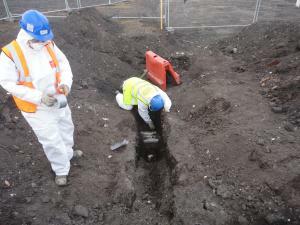 VertaseFLI was contracted by Duro Felguera to undertake remediation works within the area of site known as the ‘Carbon Capture Lands’ at Carrington Power Station, Manchester Road, Carrington, Manchester. Site investigation works across the site had identified asbestos fibres in soils above the detection limit of <0.001%, as well as loose asbestos floor tiles at surface level across a large area of hardstanding. Remedial action was required to facilitate the safe redevelopment of the site as a power station and carbon capture plant. Handpicking and disposal of asbestos tiles, excavation and disposal of asbestos soils, breaking out concrete and excavation of underlying asbestos soil. 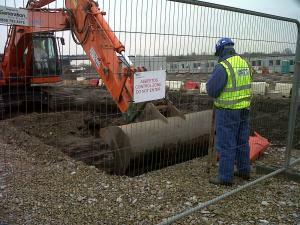 The works involved the delineation and management of a number of asbestos control zones (accessed and egressed via a decontamination unit), the excavation and off-site disposal of the asbestos soils and the validation of all resulting excavation envelopes. In addition, a high visibility geotextile was utilised where asbestos soils remained at below anticipated construction depths to provide a visual warning. Handpicking of asbestos tiles was required across a large section of the site, this area was also treated as a control zone utilising a decontamination unit and dust suppression to aid standard PPE / RPE. Strict health, safety and environmental practices were adhered to at all times and were reinforced with the full time presence of a specialist independent air analyst. Asbestos fibres in the air were measured on a full time basis and personal monitoring on numerous site workers was undertaken both within and external to the control zones. The remediation of the site presented a number of significant challenges due to the location of the control zones within a fully operational development area. Additional control measures were necessary in order to allow other site contractors to continue working safely, and on programme, adjacent to each control zone and allow the safe passage of wagons through the site and their working areas. A daily meeting was implemented to liaise with the various site contractors, informing of the following days activities, any risks associated with these and the actions that should be taken.